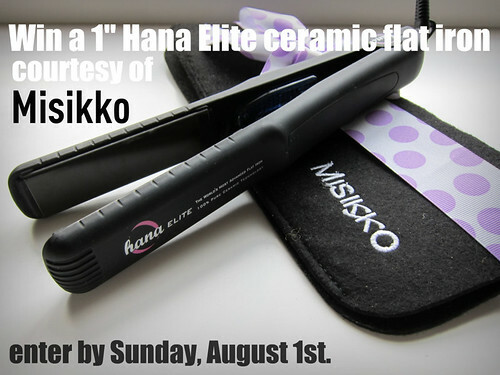 If you have not read my review of my Misikko Hana Elite flat iron, check it out when you get the chance. I even updated it with a video review/ tutorial! If you have seen it, you know that I was very impressed with my new little flat iron and that I'm super excited to be able to give one away to a very lucky Adored Austin reader. 1. Check out Misikko either online, on Facebook, or follow them on Twitter. Sign up for their newsletter for exclusive discounts and promotions (optional). EDIT: 1 August 2010: form has been deleted. Entry period has ended. Winner announced! Good luck, everyone! I'll draw the winner Monday night, on August 2nd. This contest is open to everyone, worldwide, so long as you have not won an Adored Austin drawing in the past. No need to retweet or repost or any of that madness for extra entries. Please, only one entry per person. UPDATE [27 July 2010]: My buddy Clare at Between Laundry Days is giving one away on her blog, too! Check out her review (she has hair that is totally different than mine) and enter her drawing to increase your chances of winning! *note: After the winner has been announced, I delete all your information from my inbox and server to ensure your privacy. I will never share your email address with others without your permission. Those who have opted in for the Misikko newsletter have the option of unsubscribing at any time.